• Bruce Abbott thrives on musical immersion. 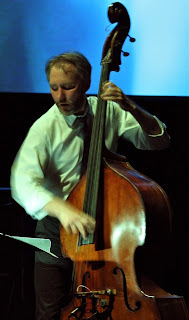 He is a database designer and bass clarinetist (“Deep Burble”). • Don Berryman is webmaster of the Jazz Police website and a videographer. His Youtube channel, Jazzarazzi, documents the Twin Cities jazz scene. • Larry Englund hosts the weekly radio show “Rhythm and Grooves” for KFAI Radio Without Boundaries. As DJ Larry Englund, he spins everything from jazz to soul, funk, world beats, and rock of many kinds. • Kip Jones is a violinist and composer hard at work here in the Twin Cities. His latest CD, Hallazgo, features 11 songs written for solo violin with voice. • Bill Kempe is a composer, conductor, singer, and ardent Stravinsky fan. • Bonnie Marshall is vice president of development for the American Composers Forum. Comments are published in the order received. It was many, many years ago that I watched Maurice Bejart’s ballet of The Rite of Spring, a powerful spectacle featuring what seemed like hundreds of dancers on stage. With only three musicians on stage Saturday night, The Bad Plus created an aural spectacle rather than a visual one. I especially like the way that Reid Anderson’s bass would be turned up at various times, creating a trio sound that seemed much greater than the sum of its parts. The accompanying video was at times a bit distracting, as I found myself wondering what music the upside-down dancer was hearing. Dave King’s drum work, coupled with Ethan Iverson’s attack on the piano, soon brought me back to full attention to their performance. I’ve no idea what a classical musician might think of their performance, but as a jazz fan, I enjoyed it. Stravinsky’s The Rite of Spring has long been one of my very favorite pieces of music. Hearing a recording of that work helped ignite within me a passion for 20th century music, and helped lead me down the path towards becoming a composer. Years ago, I studied the score as part of my compositional and conducting studies. I had the hope of someday being able to conduct it. (I was a dreamer.) Recently, that piece inspired me to compose a march for orchestra called “Spring Steppe March” (“Steppe”—get it?) based on tunes from the Rite, as well as from The Firebird and Petrouchka, which also deal with the subject of the events of spring. 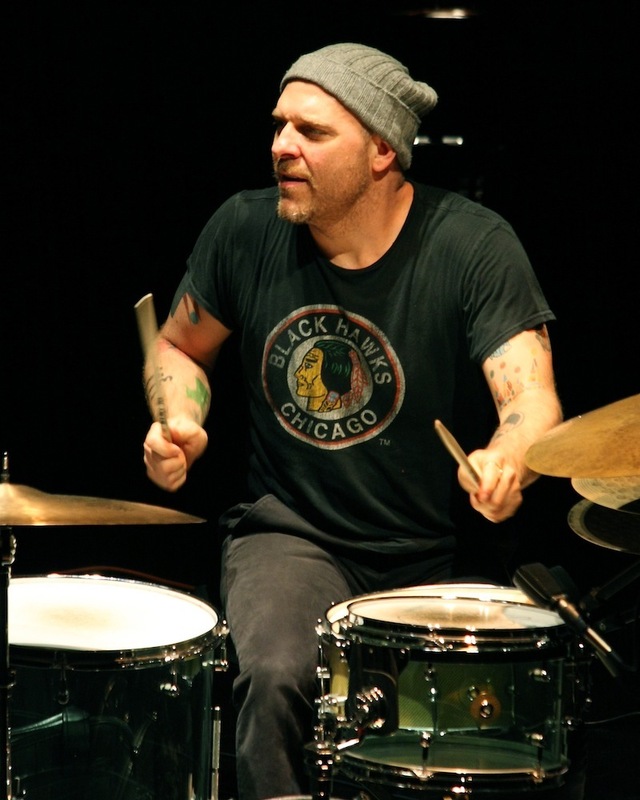 In watching The Bad Plus perform, one cannot help but be captivated by the visuals of David King's drum playing. As much as I tried to look at the other performers, my eyes kept coming back to King, and the myriad of sounds he coaxed from the drums was an absolute delight as well. King could find more sounds out of his very small (at least by rock standards) drum kit, as he played on every part of the set; the heads of the drums, the shell of the drums, the stand, the tuners. He played each of the cymbals in a dozen different ways. Also, the way in which he would strike the drums and cymbals with his sticks and mallets was unusual in that he seemed to physically lift the stick after the attack rather than just be satisfied with the natural rebound, much in the same way that a timpanist physically lifts the mallet after each stroke. The resultant sound was distinct, clear, and devoid of weight. Towards the end of the piece, I liked how the band modified the rhythm in the Danse Sacrale, taking the rigidity out of the original mixed meters, adding a touch of swing, and part of it seemed to have a surfer beat. Igor Stravinsy’s The Rite of Spring/Le Sacre du Printemps has come roaring back into my life and repeatedly captured my imagination over the last few weeks. Our relationship goes back to early viewings of Disney’s Fantasia, although that movie’s “Bald Mountain,” “Mickey and the Brooms,” and the “Dancing Hippos” come to mind more readily. In fact, I wasn’t sure until I heard Dave King mention it that the Rite actually was part of Fantasia. It just felt familiar. My recent re-rapture with this music started with the discovery a few months back that The Bad Plus were (was?) going to have their way with this piece in May. Being a fan of new music, old music, and 20th-century music, this sounded really intriguing, so I bought tickets right away. Then I decided to reacquaint myself with the Rite during the lead-up to the Loring show. I was delighted to learn that the Minnesota Orchestra was performing the piece a week before The Bad Plus, so I signed up for that as well. The MnOrch performance turned out to be part of their “Inside the Classics” series, where conductor Sarah Hicks and violist Sam Bergman discuss themes, motifs, and musical context and have the orchestra aurally illustrate on the spot. What a great learning opportunity! I love exercising both halves of my brain musically; this would allow me to both study and be in the moment. The orchestral evening was wonderful. I learned a lot about the details of the piece, and was then swept away by its fiery beauty. A delightful gem: The opening, which I was certain was an oboe solo, was actually a bassoon part, played at the upper reaches of its register. I learned that Stravinsky did this intentionally, and reveled in its throaty plaintiveness. I also learned about the piece’s riotous 1913 Paris debut as a very out-there ballet, depicting the story of a woman dancing to her death in order to release the world from winter's grip. MnOrch’s performance was not a ballet, but they did have Stephanie Fellner from Ballet of the Dolls dance one evocative section choreographed by Penelope Freeh, who was there to discuss her interpretation. I LOVE feasting on simultaneous multichannel right-brain stimuli! Right after the orchestral performance, I hustled back to the AQ in St. Paul to catch Dean Magraw’s awesome live debut of his Red Planet band’s Space Dust CD, with Dean on guitar, Chris Bates on bass, and Jay Epstein on sticks. Ran into Pamela Espeland there, who I knew was doing similar immersive research into The Rite of Spring. We compared notes (kind of a mini-study session), then switched gears (but not too much) back to Dean and company’s amazing ’60s music. Six days later, I hustled over to the Loring Theater for The Bad Plus performance of On Sacred Ground: Stravinsky’s Rite of Spring. Got there early and got good seats, about three rows back on the main floor, square in front of the trap set. I knew we were going to get a multimedia performance just seeing and hearing Dave King, one of the most expressively, joyously kinesthetic drummers I know. This was a multi-multimedia performance: In addition to Dave’s drum dancing, there was a video on a huge screen behind the band. It started with a series of nature shots, close up and further away, of a wooded area being released from the grip of winter. Melting ice dripped and flowed; The Bad Plus sat below in the dark during the opening section, a multilayered recording. Then, as the music suddenly intensified, the lights came up with a snap, and the trio came to life. From there to the end it was a riveting, enthralling, exhausting ride. The music was at times spare, at times overwhelming, always in your face. The video images changed to double-exposed gray negative images of a tall, braided dancer, undulating with herself against a black screen. The trio was by turns precise, otherworldly, intense. The dancer turned positive, and upside-down, and began leaping down and back to a shadowy, liquid reflection. The music followed, or led, also leaping. Dazed, I hung on and kept up. And when it all ended, in strident percussiveness, we sat stunned, then leapt up as one and echoed the ending with our hands and our voices. Thirty-some minutes, and the whole house, on both sided of the footlights, was dripping with sweat. Then Ethan surprised and delighted us with the announcement of an intermission, to be followed by a set of the band’s own compositions. That, too, was wonderful and unexpected and gripping. I went home and fell into bed, exhausted and satiated. Next on the docket: Further B-Plus exploration, via just-purchased Prog and Never Stop CDs, as well as another multimodal exposure to the Rite stuff via a Blu-ray DVD entitled Stravinsky and the Ballets Russes: The Firebird/Le Sacre du Printemps. Never Stop, indeed! When a hundred-instrument score is compressed into trio, the effect is something like hearing it through a telephone. I missed some of my favorite musical images, but heard many new ones, and gained another dimension of respect for The Bad Plus in the process. It’s a feat of memory to learn so many long-winded, aperiodic streams of musical content. There’s also joy in bringing a century of listening experience to bear on some of the most prophetic passages ever written. But far and away, the best aspect of the performance lay in TBP’s deep understanding of dynamics. Any TBP fan knows they have a great dynamic concept, using growth, death, and plateau as compositional axes around which musical forms (r)evolve. What impressed me in their interpretation of the Rite was the attention to dynamics inside the phrases. I think one working definition of virtuosity could be the clear presence of both a macro- and a microdynamic concept, regardless of the complexity of the source material. I think this is at the heart of TBP; because there’s no leader, there’s a huge responsibility to listen, and to understand the whole musical environment. One of the best parts about hearing great concerts as a musician is the renewed desire to practice that comes afterwards, geared toward the performers’ strengths. In this case, I’m excited about targeting dynamics: to keep in mind the long-term dynamic arc while giving each note the freedom it deserves. More than this, however, I feel taken to task to listen more deeply to the overall content of my fellow musicians' statements, but not independently of each note in their phrases, as a more sensitive seismograph. All three players of The Bad Plus are composing and performing some of the boldest music of our time, just as Stravinsky was in 1913, so this makes the trio a good fit to reimagine the Rite of Spring. This is hefty lifting for just three players, but The Bad Plus Rite honors the texture and complexity of the original Rite while bringing a freshness to the piece. I had mixed feelings before hearing the performance. I was excited, but a little nervous. It took me a while to nail down what bothered me. Did I fear the mood might be spoiled by condescending irony or Ethan’s rapier wit? Not really, since I had read about their reverent approach to the project. Was I afraid that it would sound as contrived and pretentious as Emerson, Lake and Palmer’s take on Mussorgsky’s Pictures at an Exhibition? No, these guys are much better than that, and the source material is, too. Then I realized the source of anxiety was the work itself. I think of how well Jacques Loussier adapted Bach, but that bright baroque music is well paired with a boppish jazz trio. The Rite of Spring is much more intense, also darker and dense. My memory of first hearing it live as a teenager and being astounded by the immense sound of the bassoons, French horns, and timpani made it hard for me to imagine it adequately performed by any trio. I was pleasantly surprised and relieved that they didn’t try to simulate an orchestral performance. Their performance helped open my mind to Stravinsky’s music by giving me a different view into it, and I really enjoyed it. I also think the Loring Theater setting worked quite well. I had done a bit of studying ahead of time, and On Sacred Ground: Stravinsky’s The Rite of Spring was everything I hoped it would be and more. The moment when Ethan Iverson first put his hands on the piano was electrifying. Iverson, Anderson, and King entered in darkness, took their positions, and waited through the more than five minutes of the dreamy Introduction. A blend of Iverson’s prerecorded piano and Anderson’s electronic effects, it sounded like a pastiche from the distant past; in tune and out of tune, punctuated by heartbeats and a gasp. As Iverson’s hands went down, the lights came up, and we were yanked into the bump bump bump bump bump BAH bump of “The Augurs of Spring.” It was nonstop Stravinsky action for the next half-hour. The concert includes a film by architect Cristina Guadalupe and filmmaker Noah Hutton, which flickers on a screen behind the trio as they play. A friend who traveled to Duke for the premiere thought the film was distracting. I found bits of it distracting—big red dots, a spiral out of Vertigo, static blurs—but it grew on me, and afterward, I couldn’t imagine the experience without it. One strong segment shows a dancer and her reflection, turned upside-down so the reflection is on top. In retrospect, I think we need something to watch beyond the three men on stage, playing on three instruments music written for a very large orchestra. Without the film, the music might seem impossible, a hoax—Oz the Great and Terrible. They play the whole Rite. It flies by; not because they play too fast, but because it’s so much music. The ear is often fooled into thinking more than three people are playing. Themes and melodies are passed around; you forget that the bass is most often a rhythm instrument because Anderson’s has a singing voice. King’s drums and cymbals (and plastic toy with bells inside, a signature instrument) do the work of an entire percussion section. Because Iverson can play more notes simultaneously than the other two members of the trio, he communicates more of the density and dissonance of the original. He said in an earlier interview that he wished he had an extra arm or two. It’s not all that remarkable that these smart, serious musicians who have played together for ten years—always the three of them, never a sub—would dare to wrestle with Stravinsky and prevail. What’s remarkable is that they would sound like themselves while doing it. Stravinsky is not being played by The Bad Plus, just another group of musicians; The Bad Plus, a specific group of musicians with a singular voice, are playing Stravinsky. If you need a reminder, it comes at the end, when they finish the Rite as written, then add their own crashing coda: a part of their original composition “Physical Cities.” Bump bump bump bump bump-bump-bump, bump-bump bump-bump. Like Stravinsky, only trickier. Composer and percussionist Peter O’Gorman was invited to contribute to this collection of reviews but didn’t have time. (Peter, I hope your many recitals went well.) We ran into each other soon after the concert, and he mentioned he had always felt The Rite of Spring had an unsatisfactory ending, and The Bad Plus had given it the big finish it deserved. After the Rite and an intermission, The Bad Plus returned for a second set of originals: “Giant,” “The Empire Strikes Backwards,” “Cheney Pinata,” Anderson’s still unrecorded “In Stitches” (which starts out sad and solemn, then builds and bursts into shards of glass and rain). And a playful encore: “Have You Met Miss Jones,” the faulty turntable version, speeding up, then slowing down, then speeding up again. In a final celebratory gesture, they ended the Rodgers and Hart tune with a moment from “Physical Cities,” just as they had signed The Rite of Spring. I spoke briefly in the lobby with a sweaty and exhausted Dave King. “That Stravinsky piece! There’s a lot going on,” he said, the understatement of the year. What were they thinking when they decided on a second set? “We’ve been talking about that,” he admitted. The Rite is too short to be an entire evening’s concert. What about starting with originals and ending with Stravinsky? After which everyone could go home and tumble into bed. An interesting approach to a review, Pamela, and I enjoyed reading it. Thank you, Dean. I enjoyed reading what other people had to say. It was a pretty amazing concert. Did they (or anyone else) mention the odds of a recording happening? Would loooove to have and hear this.